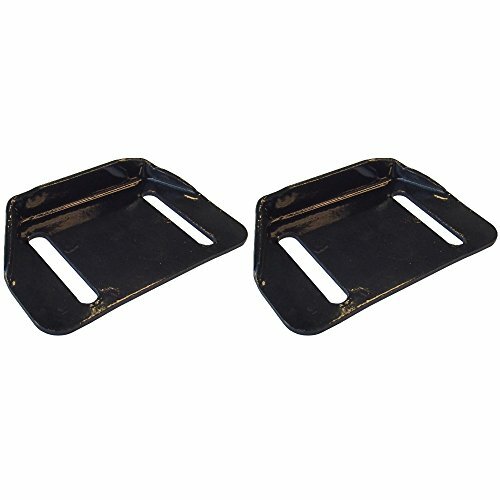 One New Aftermarket Replacement Set of Two (2) Snow Blower / Thrower Skid Shoe Plates made to fit several brands including: John Deere, MTD, Cub Cadet, Ariens, Oregon, Prime Line, Rotary, and more! SINGLE SKID SHOE MEASUREMENTS: Width: 3", Length (on Wider Side): 4-3/4", Length (on Shorter Side): 3-1/4", Widest to Widest Point: 4-7/8", Side Edge Length: 1-1/4", Oval Hole Length: 2-1/4", Oval Hole Width: 1/2", 2-3/4" Center to Center. ACTUAL PHOTOS -- Please see last picture for measurement details. Heavy Duty Metal Black Skid Shoe Plates. These do not include Mounting Hardware.